Jack the Giant Slayer is a retelling of the classic Fairy Tale of Jack and the Beanstalk. Like most of these new Fairy Tale films, it is “Darker” and “Edgier”. Well, not really, but the filmmakers and marketers want you to believe that to get you to think the movie might be more interesting. The good news is that the movie IS a bit more interesting! It is also a fairly standard Fairy Tale, which is also good if you are a fan of… Fairy Tales. If you don’t like Fairy Tales to begin with, I hope that you aren’t planning on seeing this movie anyway. You would be stupid. You don’t want to be stupid, do you? If this is your first time reading one of my reviews, let me explain that I hate when reviewers tell you everything about a movie. I think part of the fun of seeing a movie is to experience it as it happens. So I usually just tell you about the basic premise and then how the elements of the production work overall and what stands out, if anything. I also cover family-friendliness, because I have a family and I am usually pretty sensitive to “objectionable content”. I always think “could my kids watch this?” I usually cover the basics of things you may want to keep your children from at this time. In this case, I actually brought my kids with me to the screening. Based off the MPAA ratings explanation, I was pretty confident it was going to be OK for them. More on that later. In the very beginning of the film, we are treated to young Jack being told a bedtime tale by his Father. It lays out the history of the “giants” legend in a stylized animated style in a very Lord of the Rings and Hellboy 2 sort of way. There has been conflict with the race of men and the race of giants, but through a very” Lord of the Rings” bit of magic, the Giants have been enchanted into peace by a magic crown. But it’s all just a story, right? Just a bedtime story. Yep. It is. The movie then follows Jack’s hard life as a farm boy and into his teen years when he eventually dies of the black plague at the age of 19. This movie is really, really depressing. …Of course that is not what happens. Jack discovers that giants are real, there is a beanstalk that gets him up to the land of the giants and there are both valiant and treacherous characters that join him in his adventure. This all culminates in a giant um… Giant/Human war full of action, sweeping landscapes and gross-out humor. Jack TGS was directed competently by Bryan Singer, who is most well known for the X-Men films and the movie “The Usual Suspects”. He knows his way around special effects and his experience with drama means the actors and characters have a bit of depth. The Giants are the typical CGI motion capture creations that you would expect. They are stylized and cartoony enough that they are really never frightening, but are impressive from a technical standpoint. They seem real and have weight and physics to them. The acting was fine with Nicholas Hoult playing a likable and energetic Jack. Ewan McGregor brings the “muscle” as the valiant Elmont, Elenor Tomlinson plays the princess Isabelle with a bit of every “Disney Princess” pluck. One criticism is that she could have been given a little more to do than just run around confused and/or scared. I particularly enjoyed Ian McShane as King Brahmwell, and Stanley Tucci is always enjoyable in every role he is given. Bill Nighy gave voice to the leader of the Giants, General Fallon. I think that he was wasted, personally. I love Bill Nighy and this wasn’t the best use of his incredible talents. Is Jack the Giant Slayer OK for Kids? Before going I was a little concerned that it may be too much for them, especially in 3D, but those fears were unfounded. In fact, towards the middle of the climax of the movie my 5 year old daughter leaned into my ear and whispered ‘THIS MOVIE IS AWESOME”. My 10 and 8 year old sons told me that this movie was 5% better than the Hobbit. That is a good thing. As further evidence of the kid-appeal of this flick, the screening was giving away kids activity books. This movie was made for kids. It is scary enough to be interesting, but mild enough to be fun. Most of the killing happens off-screen with cut-aways before you see anything truly grisly. There were a few curse words/expletives, but only of the mildest variety. Of course you need to know your own kids before taking them to any movie. My kids have seen and love the recent Marvel Studios movies, LOTR, and the Hobbit. We also regularly watch “Once Upon a Time” and “Doctor Who” on TV as a family. My family thought this movie was a lot of fun! 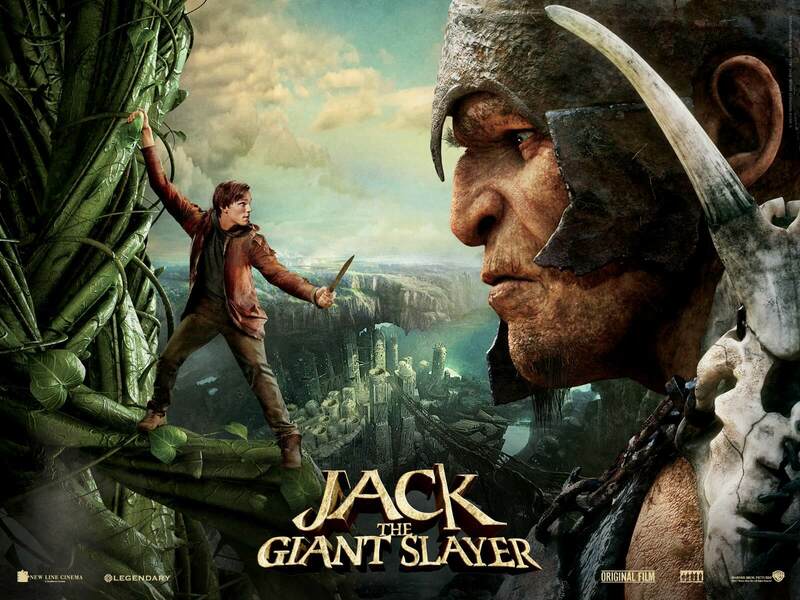 Jack the Giant Slayer takes a familiar story, puts a small twist on it and delivers a colorful, action packed tale. I think it is worth seeing on the big screen, just for all the action sequences and panoramic shots. See in 3D if you like 3D in general, otherwise go for the 2 dimensions. I wouldn’t have seen it in 3D if it were up to me, but the extra dimension didn’t detract from the movie. Good review. It’s a bunch of fun and that’s all its meant to be. At least that’s what I gained from it.